The New Zealand Mint is well known for producing brilliant proof coins, and its collection of Disney-themed coins is no exception. The latest offering of Disney coins from the mint focuses on the popular Frozen feature film, and is known as the Magic of the Northern Lights Series. Right now, the third release is available in the form of the 2016 1 oz Silver Niue Disney Frozen Olaf coin is available on Silver.com. Arrives in a Frozen storybook box with a Certificate of Authenticity. Total mintage capped at 10,000 coins for this release. Third coin in the Magic of the Northern Lights Series. 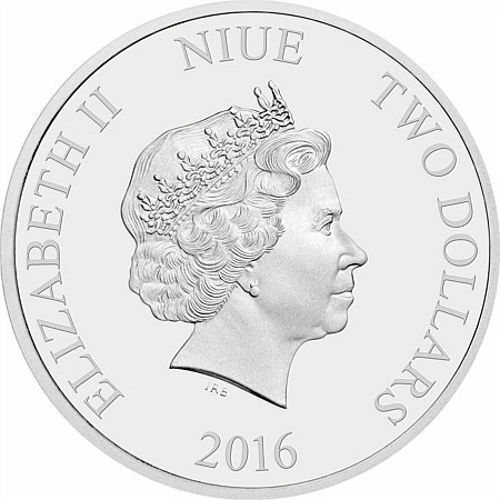 Bears a face value of $2 (NZD) backed by the government of Niue. Reverse includes the image of Olaf from the feature film. Obverse features the portrait of Queen Elizabeth II. In the first release of the Disney Frozen Magic of the Northern Lights Series, Queen Elsa debuted in her beautiful ice dress and long blonde hair. The second release in the all-new series focused on her sister, the playful and inquisitive Princess Anna. For the third release, everyone’s favorite character from the film makes his debut as Olaf the snowman comes to life (again) on the reverse of these brilliant coins. 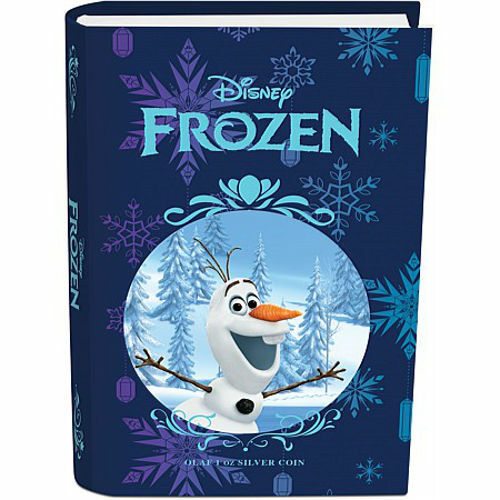 Olaf was a dream of Anna and Elsa as young girls, and came to life after Elsa unleashed her full power and built an ice castle in the mountains. His lovable nature and quick wit made him a fan favorite. On the reverse of the 2016 1 oz Silver Niue Disney Frozen Olaf coin you’ll find that lovable snowman captured, as always, with a bright and cheery look on his face. The background field on the top half of the coin exhibits the full glory of the Northern Lights, while the bottom of the field has its original silver finish. 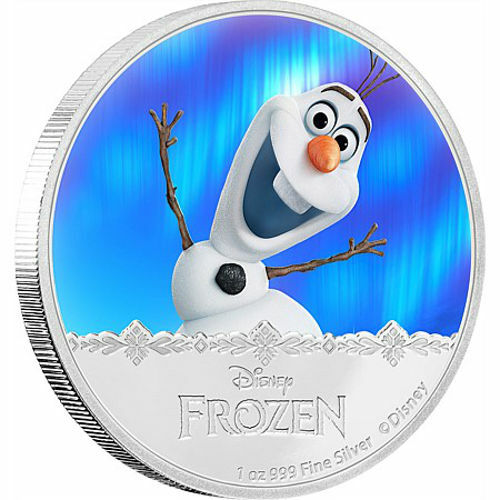 The obverse of all Disney Frozen Olaf coins features the right-profile portrait of Queen Elizabeth II. This image has been in use since 1998 and was created by Ian Rank-Broadley for use on the obverse of all commonwealth coins from Britain to Australia and New Zealand. 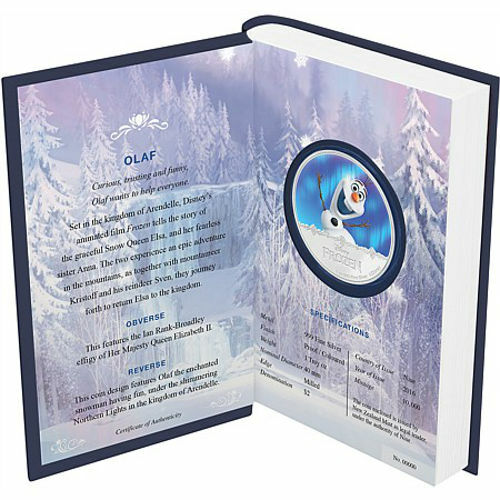 Each of the 2016 1 oz Silver Niue Disney Frozen coins, including this Olaf coin, arrives in a storybook-themed box complete with Disney imagery and beautiful colors. Your purchase also includes a Certificate of Authenticity to validate your New Zealand Mint coins. Please feel free to reach out to Silver.com with any questions you might have about these coins. Silver.com customer service associates are available at 888-989-7223, online using our live web chat, and via our email address.